The history of Sri Lanka beginning from the 3rd Century B.C. to 18th Century A.D. is one of the best documented. Our island has a collection of historical chronicles and religious writings which have no parallel in South Asia. Pre-eminent is the great chronicle the Mahawansa written in the early years of the 6th century. However, there are a large number of stories believed as history but mainly legend now ingrained in the minds of the people as truth. Kataragama has a history beginning from the time of Buddhas third visit to Lanka in the 6th century B.C. during the reign of sub-king Mahaghosha. Buddha is said to have visited Kataragama after a stop at Digavapi and meditated there to sanctify the place. The present Mangala Maha Cetiya or Kiri Vehera is supposed to have been put up at the spot where Buddha had sat. Some of the Kshatriya nobles who accompanied Vijaya to Lanka in 543 B.C. settled down and ruled there. Mahawansa records the name of the village as Kajara-Gama (p. 132-54), meaning the village flourishing with paddy fields. These nobles were among those who were invited by King Devanam Piyatissa to grace the occasion of the planting of the sacred Bo-sapling at Maha Mega Uyana which was brought from Gaya by Theri Sangamitta (Mahawansa p. 132-54). Later one of the shoots that sprung from the eight fruits yielded by the sacred Bo Tree was planted at Kataragama which is worshiped upto date by all Buddhists. Mahawansa p. 133-62). While Kiri Vehera is believed to have been built by the Ksastriyas history records that King Devanam Piyatissas younger brothers son Aggabodhi who ruled at Magama during the 3rd Century B.C. also built a stupa. It is speculated that it may be Kiri Vehera. Kataragama was thus a centre of Buddhist worship long before the advent of Elara. The origin of Kataragama Devale is not known but probably it should be after the death of Elara who ruled at Anuradhapura (Mahawansa p. 145-101). According to legend, when Elara invaded Lanka and began his reign at Anuradhapura, he had brought an Indian called Kadira and sent him to Rohana to spy on the Sinhala royals there. Kadira brought with him an Indian wife called Thevani and settled down in the village of Kataragama. (Prof. Abaya Ariyasinghe, Island) Kadira established himself so successfully that he contracted a marriage with a local damsel called Valli with the consent of his Indian wife Thevani. He had six squads of spying agents under him who in turn formed twelve sub-divisions. It was this feudal system consisting of numbers six and twelve which gave the inference that he had six heads and twelve arms at a later date when he was deified after his death. After the death of Elara he gave up his mission of spying and became a powerful man of the area helping the populace in their needs especially the Sinhalese who accepted him as a benefactor. But the Tamils living there did not recognise him but ignored him. After his death the Sinhalese put up a shrine for him, a simple building devoid of all decorations such as arches, statues of gods and idols and paid homage to him accepting as a god known as Kadira Deva or Kataragama Deviyo. The Sinhalese became the inherited officials or Kapuralas of the Temple. It is said that the Tamils living there at Kataragama did not entertain Kadira Deva at the time. The Hindus worshipping at the shrine introduced Skanda Kumara, son of Siva or Iswara of the Hindu pantheon, who is the god of war, as the reigning deity of the shrine. Skanda Kumar is the slayer of Asura named Taraka who was an enemy of the gods mentioned in the Vedas who lives in his glorious abode in heaven, where he is the chief of the martial gods and thus powerful. 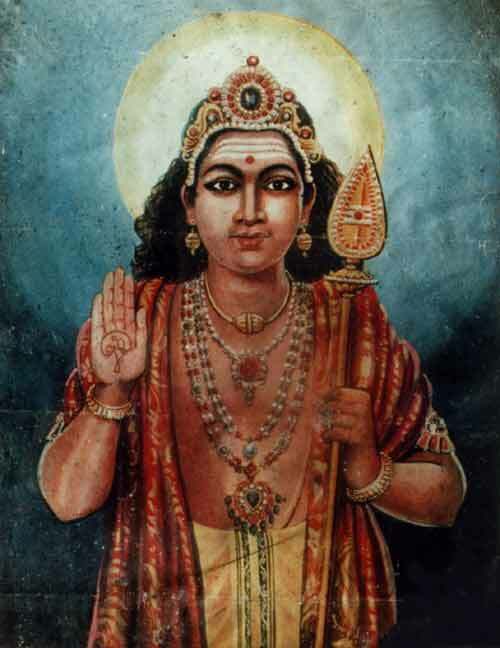 He has many names; Murugan, Arumugam, Kandasami (Skanda Swami), Subrahmanya, etc. He is the fearful god of war or youthful god of wisdom. 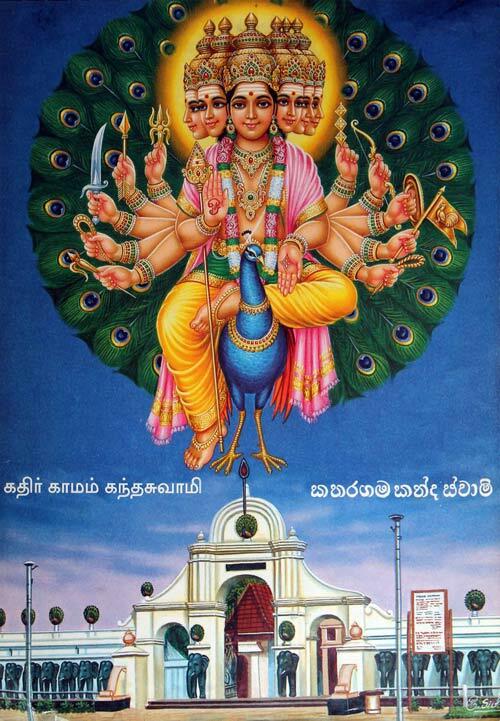 Kataragama Deviyo is identified in human form illustrated in the front curtain of the shrine accosted by his two wives riding on a peacock, his vehicle of transport. He was once real and full of blood as other human beings but became legendary. 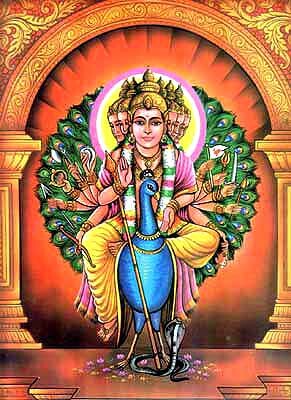 Thus the person deified as Kataragama Deviyo is a combination of two spiritual gods Kadira Deva and Skanda Kumar worshiped as one god. Since the decline of the ancient Sinhala Kingdom of Ruhuna on account of the incessant intrigues among royalty and the vast destruction and ruin brought about by frequent incursions especially by the ruthless Cholian invader Magha, both the kingdoms of Ruhuna and Anuradhapura ceased to exist rendering the once great kingdoms to ruin. Roads and byways disappeared within a short time. The country was swallowed up by the jungle striving to blot out everything on its path rendering it to be the abode of wild animals. After the defeat of the Damilas, Sinhalese kings confined themselves to rule at Dambadeniya, Yapahuwa, Kurunegala, Gampola, Kotte and Kandy. The remains of the ruined cities of Anuradhapura and Ruhuna were gradually devoured by the cruel jungle which crept on every acre of land hiding them from human view for over four centuries until the last foreign conquerors, the British after bringing the whole island under their sovereignty by deceitfully adding the Kingdom of Kandy directed their interest in taking action to preserve the remaining traces of Sinhalese civilisation. The wild jungles of Ruhuna had almost approached the precincts of Tissa Dagoba built by King Kavantissa. During this dark era the existence of the ancient Shrine was known only to the scattered few villagers who lived at Kataragama undergoing great privation. They worshiped at the Shrine adhering to the faith of their ancestors on god Kataragama. According to the Census of Ceylon II 464 - the village of Kataragama had only 103 inhabitants in 1921 where there was a much visited shrine. All pilgrims to this shrine had to go on foot as there were no proper roads at that time. Robert Knox in 1681 had noted that the roads were so narrow that two people could not walk abreast. At the time the Portuguese conquered the coastal belt of Sri Lanka the mode of transport available were palanquins, pack horses, elephants and most people walked on foot. The road from Colombo to Galle was a crude sandy track. As for bridges Sri Lanka had none till the end of the 15th Century. The ancient network of roads of the Sinhalese had been obliterated by disuse. It was the British who were the pioneers in road construction undertaken by Major Skinners 1818 - 1887 who built over 3000 miles of roads. At the beginning the roads were grovelled or dressed with metal. Macamadising came later. During early nineteen nineties the journey to Kataragama was a hazardous one. People mostly travelled on foot or by bullock cart. The writer could recollect what he saw during his Kindergarten days in school at Dodanduwa back in 1920. He saw strings of carts gaily decorated with white flags and ever sounding bells hung on the hoods of the carts passing his village followed by white clad men and women on foot while the old and feeble sat with out-stretched legs inside the carts. With the improvement of road transport large numbers of people both Buddhists and Hindus began to throng on Kataragama. The Catholics and Christians are attracted to Kataragama for they had faith in the pooja performed at the Shrine. The Christian sacrament called the eucharist in which bread and wine are consecrated and consumed just as milk rice and holy water are taken by the Buddhist and Hindu devotees in their cupped hands and drink with bowed head in utmost respect very much like Catholic mass which is the same in substance and form. The Muslims have their own shrine at Kataragama where they perform their religious rites at the grave of a Muslim dignitary Saul Palkudi Bawa. These rituals and practices in the world of religion were celebrated long before Christianity was introduced to Sri Lanka. Millions worship at this shrine irrespective of the religion they profess. This is a multi-religious shrine. At this Devale there are no arches, figures of gods and idols seen in Hindu Temples elsewhere. The Holy of Holies is hidden by a Curtain with the portait of Sri Subramaniam or god Kataragama with his two consorts Vally Amma and Thevani Amma. The road from Tissamaharama to Kataragama is a cart track and no motor vehicles were allowed on this road until late fifties. The wheels of the carts and the hoofs of the cart bulls had turned the rich red soil into soft brown powder that when a line of carts traverse the road clouds of disturbed dust fill the atmosphere that no pedestrian could venture to take the road until the dust subsided. The surrounding foliage of the jungle on both sides appeared brown daubed in the red dust. Of the teeming crowds that flock to Kataragama to invoke blessings or pay off vows many deem it an act of merit to go the whole way on foot, walking in the cool of the night and sleeping off the exhaustion by day. They traverse the perilous path confident in the safety of their own faith. Starting from Tissa for Kataragama one enters the forest wilderness within half a mile. From the start the forest smells the scent of the jungle atmosphere and birds fly from tree to tree joining in carols and chirps. Wild animals are not uncommon in these parts. You may hear the elephant trumpeting closeby or confront them crossing the pathway. The air is heavy with the heat beating upon the earth as the sun looks down from the cloudless sky. The forest has always had an inexpressible attraction to the human mind of whatever degree of culture. To the sage it envisages a place for retirement from the conflicts of the world and obtain peace. The moment you advance a few miles from Tissa the forest on either side make you feel the divine life creeping into your nerves. Kataragama is an attraction for all time. The sylvan simplicity is disturbed by modern traffic. The shade of secluded serenity lasted not for long with the march of time and advancing modern road construction. The holy place is now urbanised. Hotels, guest houses, pilgrims rests and commercial buildings have encroached upon the boundary of the Menik Ganga in close proximity to the Devale on the other side of the river. The Menik Ganga flows placidly shaded by giant kumbuk trees as old as time on either banks. The Menik Ganga is venerated by the Hindus as well as Buddhists as a sacred river. During early days there was only a suspension bridge to cross it now replaced by a narrow concrete bridge not meant for vehicular traffic. It is believed that god Kataragama can change his form at will that at one time he is Subramaniam, the Creator, at one moment he is the fearful god of war or child Muruga in tender beauty always and all times everywhere at the service of the devotees. Offerings are made bordering on fear. Kataragama god is known for his revengeful disposition. Seldom does a person who believes in him ever utter anything that is likely to offend the deity. Those who have ventured to invade Kataragama in a spirit of adventure or fun have strange tales to relate. Once a camera failed to record a picture taken and guns inexplicably failed to fire. Those who scoffed at god Kataragama have been known to lose their way in the jungle to die of hunger or be torn by wild animals. Novices visiting Kataragama are advised to guard their tongue and behaviour. Loose talk and slighting of objects held sacred are the surest means of courting sudden disaster and woe when in or on the way to Kataragama. The religious rites so solemnly performed at Kataragama by devotees yet so grotesque carry some enchantment in the air stirring in the heart homage and reverence towards the unseen god bordering a vestige of primitive superstition. Devotees clad in frugal attire of only a tucked up veti with their foreheads, chest and arms daubed in holy ash hang on scaffolds pinned on steel hooks fixed to their skin to expiate their sins and wrong doings. The men we see dangling from a scaffold or dragging a cart dedicated to the god with offerings they are all ordinary people, simple folk. The other most breath taking event performed at Kataragama which amasses and baffles foreigners as well as locals is the fire walking. In preparation of the fire walk a long trench of about two fathoms long and a fathom broad is packed with hard wood logs like Milla and when the logs are fired and burnt to cinders they are collected by means of long poles and formed into a layer of about a foot thick. Fire walking is done on the day previous to the conclusion of the great Perahera in which the image of the god is taken amids deafening sounds of drumming and blowing of trumpets to the temple of Valli Amma to symbolise his reunion with the sensuous Valli. The person who proposes to perform fire walking prepares for long periods refraining from taking meat and fish and depend on vegetables and milk only for seven days. Fire walking is a religious ecstasy of walking over raging cinders carefully prepared for them. The large scale fire walking ceremony is performed for the purpose of satisfying a deity called Kadawara Deviyo believed to be the guardian of the Maha Devale. Those who partake in this ritual do nothing to prepare their feet in the form of applying anything on their feet. It is by sheer faith they dare to walk the fire trench shouting "Haro hara" all the time while the crowds put their hands up together in homage to the god whose miracle they perceive performed before their eyes. They come out of the ordeal by fire unharmed, unscathed and confident in their faith like the Biblical Heroes of old Shadrach, Meshach and Abed-Nago, who came through their ordeal by fire unharmed and confident in their faith. What is the secret of fire walking? Does it depend on frenzied emotion acting as an anaesthetic making the participants insensitive to pain? There is not only no pain but no scalding or wounds after partaking in the event. 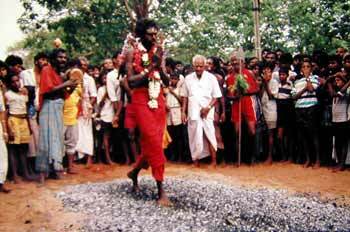 Fire walking is not just a tamasha or a magic show, it is a serious religious act of devotion performed in fulfiling a vow. Some say it is sheer will power! Article courtesy of The Island Saturday Magazine (Colombo) of March 3, 2001.